Chances were few and far between, although Albion keeper Mathew Ryan made two excellent second half saves, while Newcastle stopper Karl Darlow made a smart stop to keep out Lewis Dunk's header. 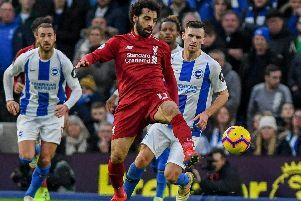 Brighton defended well throughout and remain 12th in the Premier League, with 22 points from 21 games, and three points ahead of Newcastle. Albion captain Bruno superbly headed clear a dangerous Isaac Hayden cross under pressure from Joselu on 14 minutes, before Albion defender Shane Duffy headed a Pascal Gross corner over two minutes later. With the home fans becoming frustrated as Albion enjoyed plenty of the ball, Seagulls keeper Mathew Ryan had to be alert to parry Dwight Gayle's cross-shot and then he quickly got to his feet to gather the rebound before Joselu could shoot. Anthony Knockaert fired a 20-yard shot straight at Karl Darlow on 26 minutes, before Bruno picked out Albion top-scorer Glenn Murray at the back post a minute later but the striker completely missed the ball from six yards out, however the offside flag spared his blushes. Albion continued to look the more likely to open the scoring and forced their fourth corner on the half-hour mark but Duffy fired high and wide following a scramble. The hosts broke quickly on 36 minutes but Gayle's low shot was blocked by Duffy, before Mikel Merino dragged the ball well wide of Ryan's goal from 20 yards. Joselu then sent a shot wide from 22 yards four minutes later. Albion won their fifth corner of the half on 42 minutes but Duffy headed Gross' delivery just over as the sides went in level at the break. Newcastle started the second half on the front foot and Ryan got down well to his right to push away Hayden's deflected shot on 49 minutes. Gross drove a low free kick straight at Darlow on 53 minutes from 22 yards, before Ryan was forced into an excellent reaction save when he dived high to his left to keep out Gayle's glancing header five minutes later. Albion looked their most dangerous from set-pieces and they went close from another corner on 68 minutes. Duffy headed Gross' cross back into the danger area and Lewis Dunk's close-range header was pushed to safety by Darlow. At the other end, Dunk blocked a low Gayle drive and the Newcastle striker then went down under a Davy Propper challenge but referee Anthony Taylor waved away the home fans' penalty appeals. Newcastle had another penalty appeal turned down on 75 minutes when Merino went down. There was little goalmouth action after that as honours ended even at St James' Park. NEWCASTLE: Darlow; Yedlin, Lascelles, Clark, Dummett, Ritchie (Perez 72), Hayden, Merino (Shelvey 76), Atsu, Gayle, Joselu. Subs: Murphy, Diame, Mbemba, Manquillo, Woodman. BRIGHTON: Ryan; Bruno, Duffy, Dunk, Bong; Knockaert, Stephens, Propper, March; Gross; Murray (Hemed 62). Subs: Kayal, Baldock, Goldson, Izquierdo, Schelotto, Krul.